The Magic Cafe Forums - The November Issue of Genii Has Escaped! If you're not subscribing to Genii, you're missing out on a world of magic! Join us at www.geniimagazine.com. balderdash, baloney (also boloney), beans, bilge, blarney, blather, bosh, bull [slang], bunk, bunkum (or buncombe), claptrap, drivel, folderol (also falderal), folly, foolishness, fudge, hogwash, hokeypokey, hokum, hooey, humbug, humbuggery, jazz, malarkey (also malarky), moonshine, nonsense, poppycock, rot, rubbish, senselessness, silliness, stupidity, tommyrot, trash, trumpery, twaddle. 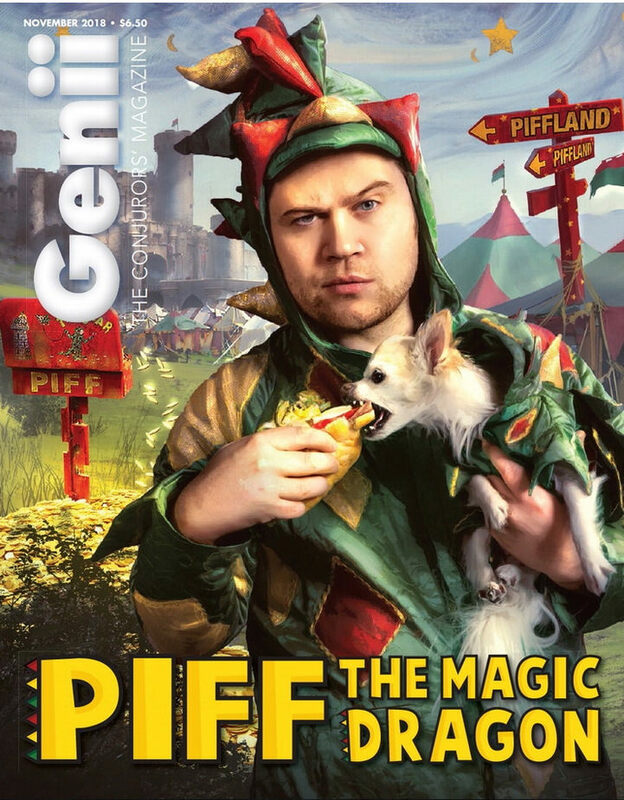 Anyway, Piff the Magic Dragon is on our cover. I interviewed Piff twice over the course of two days in Frisco, Texas, and then sent the whole thing off to Jared Kopf, who transcribed the interview and then wrote his own piece as an introduction. Piff then hijacked the interview (during his fact check) and pulverized it. I think it’s both funny and revealing. Hannibal, who gets lost under in Mexico. John Bannon, who takes the Mexican out of Elmsley’s "Mexican Prediction." Jonathan Pendragon, who has performed in Mexico, but that's not what he's writing about this month in "Panmagium." In Martin Lewis's final Genii column, he spins a top on a bunch of ESP symbols before fleeing to Mexico. Mike Caveney writes about that Nazi *** Kalanag, who did not follow the heads of the Third Reich through Mexico to South America. Todd Karr brings us all the news in "The Eye," John Guastaferro touts three tricks in "Magicana," and Jon Racherbaumer slings another "Slant" our way. Tricks, videos, and books are reviewed by Danny Orleans, Nathan Coe Marsh, and John Lovick. At the top of p.11 there are audio columns by John Lovick (who interviews Piff, politely) and Jon Racherbaumer (who referred to himself as The Perpetrator in his peripatetic youth), and some junk from YouTube that I found. Placate your pals by putting on a party! This page was created in 0.14 seconds requiring 5 database queries.